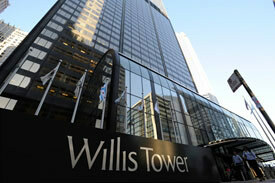 Willis Tower is being the headquarters of Willis North America’s Midwest Region. The former (1973-2009) name of the tower is Sears Tower. Willis Tower is the gigantic and second tallest building in the Western Hemisphere. The tower stands proudly at 1450 feet with 110 stories. The US skyscraper is in Chicago, Illinois Wacker drive. Sears Roebuck & Co., was the largest retailer in the world in 1969 who had 3,50,000 employees. The company planned to have a central office space for its workers. Hence, they hired the architects Owings, Merrill, and Skidmore to design the largest office building around the globe. The construction work took three years to complete. It used sufficient concrete to make five-mile long, eight-lane highway. 12,000 workers, Chicagoans and Sears employees signed the last beam as a token of honor. Willis Group Holdings, a London based insurance broker leased over 1,40,000 sq. ft of office space on the three floors of the Sears Towers in 2009. The lessee had received the naming rights for 15 years. The building officially had a name called â€œWillis Towerâ€ in 2009. There are nine tube frames in the building. The plan had an idea of making not less than fifteen tubes, but the hotel as at the dusk. The workers used only nine tubes during the completion. All the nine tubes reach 49 stories. The two tubes end at the pinnacle. The other rose up to the 65th floor. The towerâ€™s design is the Crucifix shape from 66th to the 90th floor. Sears tower Sky deck is otherwise called as the â€œSears Tower’s observation deckâ€. This is the most popular attraction in Chicago. 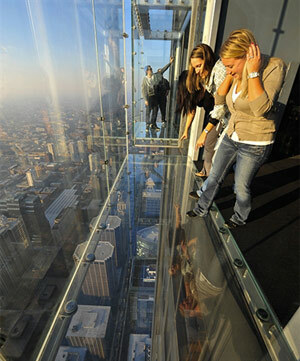 â€œThe ledgeâ€ is a glass balcony extending 4.3 ft where the tourists can look straight down. Though the people feel uneasiness during the first visit, the place gives spectacular views of the Chicago River and Wacker Drive. Willis Tower Chicago is the 16th tallest building in the world and second tallest in Western Hemisphere. Until 1998 Willis Tower was the worldâ€™s tallest building. Over $175 million was spent to build the tower. From the Sky deck the tourists can see four states such as Illinois, Wisconsin Indiana, and Michigan. There are approximately 16,100 windows. Radio broadcasting and television stations work from the rooftop of the Willis tower. Over 25,000 visitors visit here daily. 1450 feet is the Willis tower height; while adding twin antennae, the height comes to 1730 feet. There are totally 104 elevators in the tower; they move 1200 feet per minute. Conference rooms are at the size of 16,000 sq.ft. Events are celebrated in the 99th floor. There are 25 miles of plumbing, 80 miles of elevator cable, 1,500 miles of electric wiring, and 145,000 light fixtures in the building. The building is officially indulged in Recycling program. The tenants recycled over 2,103 tons of paper, plastic and construction waste, glass, aluminum annually. The building tenants saved more than 10 million gallons of water annually.